The much-anticipated new album from Preoccupations comes a bit more into focus this morning, as the band has shared the second single from their forthcoming New Material. “Antidote” is a mercurial rock odyssey highlighted by Matt Flegel’s hypnotic vocals and Mike Wallace’s distorted, powerful drums. The commanding track is accompanied by a psychedelic video that starts at disorienting before nosediving into unreality. “Antidote” is about humans forgetting that we’re apes, it’s about trying to make sense out of something that we’d be better off not trying to make sense of. It’s about having infinite knowledge at our fingertips, but still making all the wrong choices over and over. It’s about trying to find a moment in your day where you can take a breath and remember that we’re basically all just animals bumbling around. Where “Antidote” is oddly reassuring in its acknowledgment of the human experience’s absurdity, New Material’s lead single “Espionage” was impossibly bleak, described by Flegel as “an ode to depression … and looking inward at yourself with extreme hatred.” Yet where “Espionage” was instrumentally bright and accessible, “Antidote” is dense and unpredictable, every bit as challenging as “Espionage” was gratifying. The two tracks’ contrasts demonstrate New Material’s potential to make its mark on 2018’s musical landscape, from a band that’s becoming more essential by the day. 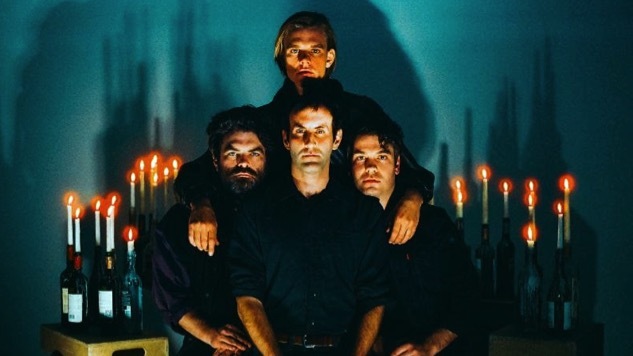 Preoccupations have a spring world tour on the books, with stops in North America throughout April and May. Theirs is the kind of explosive live show that makes the question “Is rock ‘n’ roll dead?” sound especially stupid. You can see the band’s full tour slate right here. Preoccupations’ new album is out on March 23 via Jagjaguwar. Watch the “Antidote” video (dir. Michael Wallace and Evan Pearce) below, and revisit previous single “Espionage” and the details of New Material here.